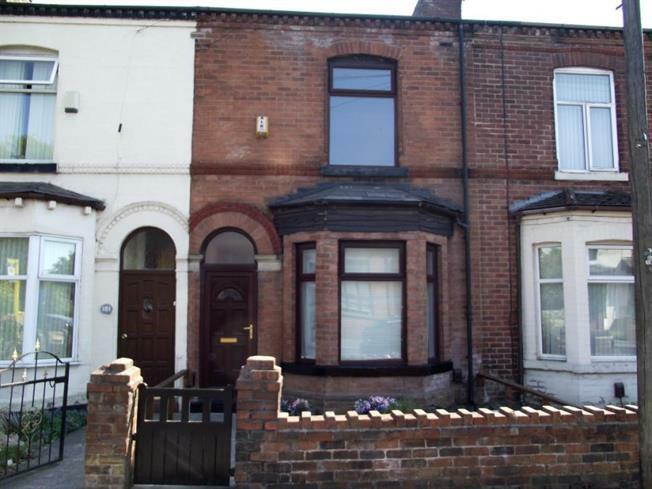 2 Bedroom Terraced House For Sale in Newton-le-Willows for Offers Over £100,000. This two bedroom terraced is immaculate & available with no onward chain. With two reception rooms and additional rear access parking, this property is ideal for a first time buyer or an investor. The property briefly comprises to the ground floor, entrance hall, lounge, dining room and kitchen. To the first floor there are two large double bedrooms, and a large family bathroom. To the rear there is a large yard which has the option of off-road parking. Double glazed uPVC window facing the rear overlooking the yard. Radiator, vinyl flooring, chimney breast, ceiling light. Double glazed uPVC bay window facing the front overlooking the garden. Radiator, carpeted flooring, shelving, ceiling light. UPVC back double glazed door, opening onto the yard. Ceiling light. Wall and base and drawer units, single sink, space for oven, space for. Double glazed uPVC window with frosted glass facing the rear overlooking the yard. Panelled bath with mixer tap, shower over bath, pedestal sink with mixer tap.